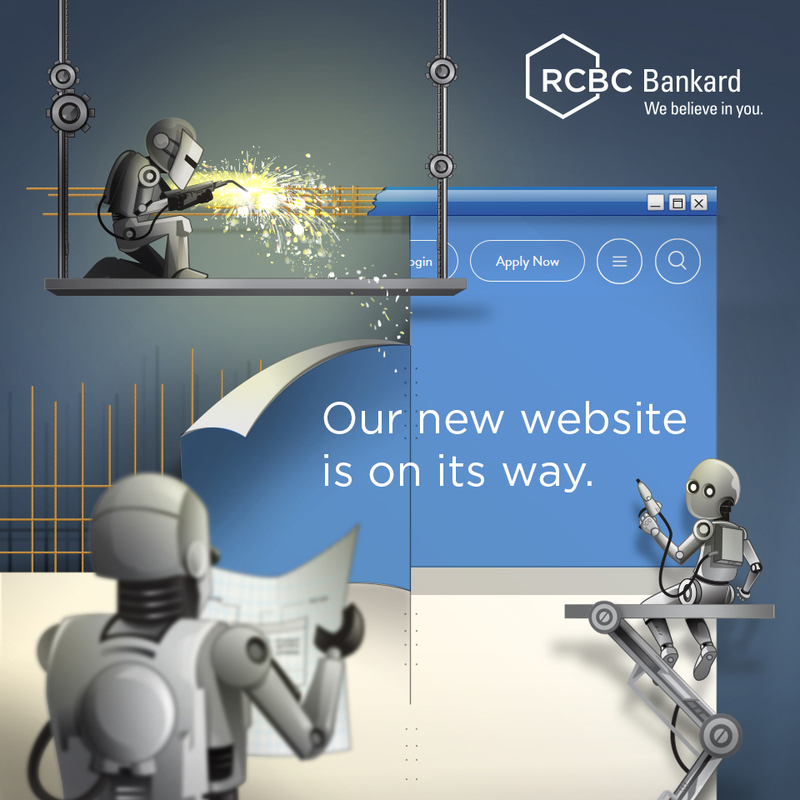 Register online with your RCBC Bankard Mastercard HERE. The promo is open to all existing RCBC Bankard Mastercard Principal and Supplementary cardholders (“Cardholders”) whose accounts are active and in good credit standing, excluding cardholders of the Corporate Card. Online registration and spend period is from March 25 to June 25, 2019. Redemption is from April 1 to August 31, 2019. The cardholder must only register ONCE within the specified period and ensure that correct details are entered. Registration with incomplete card number and misspelled name will not push through. The cardholder must use his/her RCBC Bankard Mastercard credit card within the promo/spend period and make a minimum single-receipt straight purchase of P5,000 and up or a single-receipt straight or installment spend of P25,000 and up ANYWHERE, including overseas or online. The following transactions are excluded from the promo: Installment, Balance Conversion, Cash Advance, CHARGE, Balance Transfer, Cash Loan, and Your Cash. Monthly amortizations from installment transactions/installment plan availment or conversion are not qualified. The cardholder will receive an electronic gift code (“gift code”) via SMS three (3) to five (5) working days after his/her transaction has been posted. When redeeming, the qualified cardholder must present his/her gift code at any KFC store. One (1) gift code is equivalent to one (1) KFC freebie. A gift code can only be used once. KFC will validate the gift code via POS or online. Redemption is valid for dine-in and take-out only and is not valid for delivery. The gift code is valid until 60days upon receipt via SMS. Transactions generated from casino/gambling, commercial fuel/gas, money transfers, quasi cash financial institution, political organizations, bail bond payment and business transactions as well as from merchants specifically engaged in wholesale and distribution (ex. Warehouse clubs, SuySing) and multi-level marketing (networking) such as Fern, Amway, UNO, Herbalife, Royale Business Club, etc., are not qualified. Splitting of transaction shall be deemed fraudulent and shall not be allowed for redemption. Splitting is defined as an intentional act of dividing a single transaction into multiple transactions to redeem more than one freebie. Split transaction is presumed when there are 2 or more transactions in one merchant outlet or establishment over one and the same product or service, and the interval of these transactions were made within 5 to 10 minutes. RCBC Bankard reserves the right to charge the cost of the freebies redeemed against the cardholder’s RCBC Bankard Mastercard should his/her redemption be found to be fraudulent. 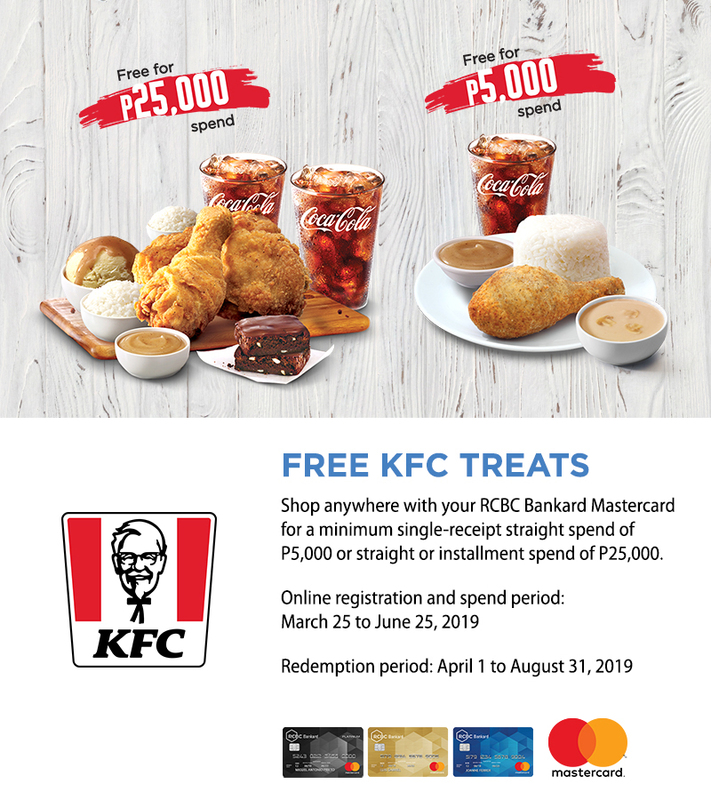 The offer cannot be exchanged for cash, rewards points or products other than the offers indicated above and cannot be availed of with other ongoing promotions of RCBC Bankard & the merchant partner. Any dispute concerning the promo offer and accompanying service shall be settled directly between the cardholder and KFC. In case of dispute with regard to the customer’s eligibility and availment of the promo, the decision of RCBC Bankard with the concurrence of DTI shall be considered final. However, if dispute involves KFC and its performance and/or delivery of services and/or products to customers, subject to the Promo Mechanics stated above, the decision of RCBC Bankard and KFC with the concurrence of DTI shall be considered final.